Season to Taste is an aspiring chef’s moving account of finding her way—in the kitchen and beyond—after a tragic accident destroys her sense of smell. Molly Birnbaum’s remarkable story—written with the good cheer and great charm of popular food writers Laurie Colwin and Ruth Reichl—is destined to stand alongside Julie Powell’s Julie and Julia as a classic tale of a cooking life. 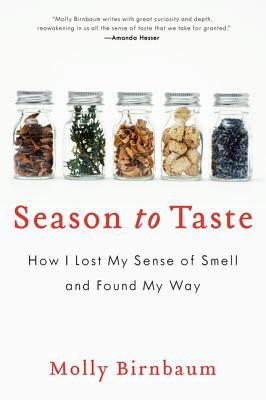 Season to Taste is sad, funny, joyous, and inspiring. Molly Birnbaum is the recipient of the Pulitzer Traveling Fellowship in Arts and Culture from Columbia Journalism School. Her work has appeared in the New York Times, O, The Oprah Magazine, and ARTnews magazine, and she writes the popular food blog My Madeline.